Ancient communities in Syria and Iraq are in mortal peril. Can the West find a way to preserve the Christian presence in the Middle East—and stave off a ‘clash of civilizations’? 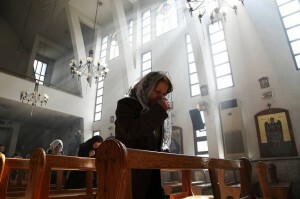 A woman attends a mass at Ibrahim al-Khalil church in Damascus on March 1, in solidarity with the Assyrians abducted by Islamic State militants in Syria. Almost a third of Syrians were Christian as recently as the 1920s, but only about 10% of the country’s 22 million inhabitants at the onset of the current civil war were members of Christian communities. That long and slow relative decline has accelerated as hundreds of thousands of desperate Christians, along with millions of their Muslim fellow citizens, flee the fanaticism of Islamist rebels and the brutality of Bashar al-Assad’s regime.